A political party of Indian origin today received a berth in the Sri Lankan Cabinet after pledging crucial support to the minority government of President Chandrika Kumaratunga. The Ceylon Worker's Congress (CWC) accepted a Cabinet ministry and a junior ministry as part of its deal to extend support to the Marxist-backed Freedom Alliance Government. Hurricane Ivan continued its relentless march towards Jamaica, Cuba and Florida after killing 23 persons in the Caribbean islands and destroying almost 90 per cent houses in Grenada. The headquarters of the Grenada broadcast network is pictured with its transmission tower a twisted wreck in St. George's on Thursday. 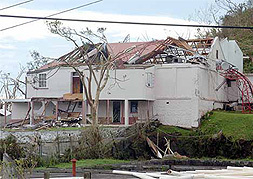 Hurricane Ivan slammed into Grenada on Tuesday, flattening or badly damaging homes and cutting power. The Bush Administration for the first time on Thursday described the rapes, killing and pillaging in Sudan's western Darfur region as "genocide" and urged the United Nations to undertake a full investigation. Secretary of State Colin L. Powell told the Senate Foreign Relations Committee: "I concluded, that genocide has been committed in Darfur." 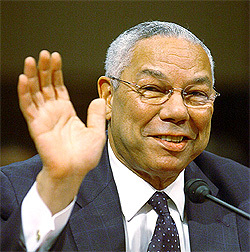 US Secretary of State Colin Powell gestures as he testifies before the US Senate Foreign Relations Committee on "The Current Situation in Sudan and the Prospects for Peace", in Washington on Friday. Powell said that genocide has occurred in the Western Sudan region of Darfur and the government of Sudan and the Janjaweed militias bear the responsibility for it. A political party of Indian origin today received a berth in the Sri Lankan Cabinet after pledging crucial support to the minority government of President Chandrika Kumaratunga. The Ceylon Worker's Congress (CWC) accepted a Cabinet ministry and a junior ministry as part of its deal to extend support to the Marxist-backed Freedom Alliance Government to give it the working majority it needed in the 225-member assembly. CWC M.P. Muttu Sivalingam was appointed Minister of Estate Housing, Infrastructure and Community Development while another CWC MP M.S. Sellasamy was made his deputy. The party said with the support of their eight MPs the government would now be able to carry forward its legislative programme as well as the stalled peace process. The CWC wants the government to start negotiations with the Liberation Tigers of Tamil Eelam (LTTE) based on the LTTE's interim self-governing authority's proposal, unveiled in October last year. The Freedom Alliance had only 107 legislators, including two who defected from opposition parties, but still short of six MPs to cross the 113 number required for a simple majority. The direct hit by Ivan, the most powerful storm in a decade, did “destruction beyond any imagination”, Grenada’s Prime Minister Keith Mitchell said. Among the buildings it destroyed was a 19th century stone prison sending criminals back on the streets. The United Nations is sending a team to the battered country to assess the damage and how the world body could help in overcoming effects of the vast destruction. Hurricane warning was posted today in Jamaica and hurricane watches were up in parts of Haiti, Dominican Republic and Cuba. According to reports from Jamaica, people were seen queuing up to store gas, water and other essentials and schools are being turned into shelters. The Bush Administration for the first time on Thursday described the rapes, killing and pillaging in Sudan's western Darfur region as "genocide" and urged the United Nations to undertake a full investigation. Secretary of State Colin L. Powell, who visited Sudan earlier in the summer, told the Senate Foreign Relations Committee: "I concluded, that genocide has been committed in Darfur." He said both the Sudanese government and the Khartoum-sponsored Janjaweed militia were responsible for the genocide that "may still be occurring." "Call it civil war. Call it ethnic cleansing. Call it genocide. Call it 'none of the above.' The reality is the same. There are people in Darfur who desperately need the help of the international community," Mr Powell added. In Khartoum, Sudanese officials rejected Mr Powell's assessment. Mr Powell earlier told the Senate panel: "I more than expect, I know, that the government in Khartoum will reject our conclusion of genocide anyway. Moreover, at this point, genocide is our judgment and not the judgment of the international community." On the heels of Mr Powell's testimony, the White House released a statement from President George W. Bush saying the USA was "appalled by the violence" in Darfur. The United Nations Security Council had adopted a US-sponsored resolution on July 30 that called on the government of Sudan to disarm the Janjaweed militias. Mr Bush said Khartoum had not complied with the resolution, "and has not respected the cease-fire which it signed. The rebels are also guilty of cease-fire violations and failing to carry out past commitments. It is clear that only outside action can stop the killing." The Bush Administration has sought a new Security Council resolution to authorise an expanded African Union security force to prevent further bloodshed. Asked about Mr Powell's remarks, and whether it would lead to the invoking of the Genocide Convention, UN spokesman Fred Eckhard said: "We will now have to see the next step. The matter is being brought to a competent organ of the United Nations, the Security Council. We'll have to see what action the council takes." The US Ambassador to the United Nations, Mr John Danforth, said the fresh US-sponsored draft resolution had received a "very positive" response in the Security Council. He was hopeful the resolution would be passed by next week. However, this optimism might be premature. China and Pakistan, both members of the Security Council, favoured engagement with Khartoum over confrontation, and the Chinese representative threatened to veto the resolution if it came up for a vote. Mr Powell admitted Khartoum had met "some of our benchmarks such as improving humanitarian access, engaging in political talks with the rebels and supporting the deployment of observers and troops from the Africa Union to monitor the ceasefire between Khartoum and the rebels." What was really needed, he said, was for the Janjaweed militias to cease and desist their "murderous raids" and for the government in Khartoum to "stop being complicit in such raids." "Khartoum has made no meaningful progress in substantially improving the overall security environment by disarming the militias or arresting its leaders," he added. Mr. Danforth, meanwhile, stressed the need for the African Union - which has monitors in place in the region - to play a vital role. "The importance of getting an outside presence into Darfur to monitor the situation is something that's impossible to overstate. That provides the most immediate assurance to the people of that region that they will have some protection," he said. Peace talks taking place in Abuja, Nigeria, between representatives of Khartoum and the two Darfur rebel groups, the Sudan Liberation Army (SLA) and the Justice and Equality Movement (JEM), are deadlocked. The human rights situation started deteriorating in Darfur after February 2003, when SLA attacked government forces, saying that they were taking action against the marginalisation of Darfur and the failure of the Sudan Government to protect farming groups from nomad raiders. At the end of March 2003, after initially talking about reconciliation, the Government of Sudan decided to solve the problem by repression. It allowed free rein to government-supported Janjaweed, militia drawn mostly from Arab groups, to attack black African villagers in Darfur. The conflict has left thousands dead and over 300,000 homeless.